I was asked about Kaak A’ras a type of bread found in American-Lebanese communities specifically baked at Easter. I had always eaten Kaak bi haleeb but was not sure if they were the same but with different names. So I decided to go looking for it in Lebanon and went in search of this treat in the town of Zahle. The Lebanese, take kaak for granted, it belongs to daily life. Kaak is not a supermarket type of bread; it is street food, it is out there with the human hustle bustle. Eat it on the go with or without filling, it costs a few pennies and satiates hunger. There is early morning kaak - crunchy sticks sprinkled with sesame - served with coffee and there is afternoon kaak - a round pouch-like puff with a handle - generally sold by peddlers on motorbikes . There are also the feast days kaiak or dainty little cakes filled with dates, walnuts or pistachios also known as Maamoul. Now, Zahle is famous for its cafes along the Berdawni River, its invigorating climate and its population’s fighter spirit. 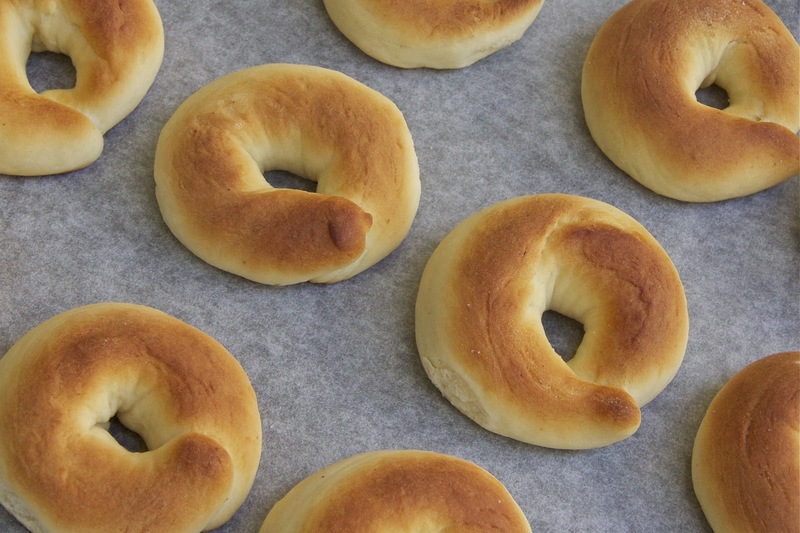 But Zahle is also famous for kaak-bi-haleeb - kaak with milk - a swirl of a bun made with leavened sweet dough. Flavoured with mahlep this type of kaak is deliciously plain with a texture so soft that it melts in your mouth, once you’ve had one bite you become hooked . 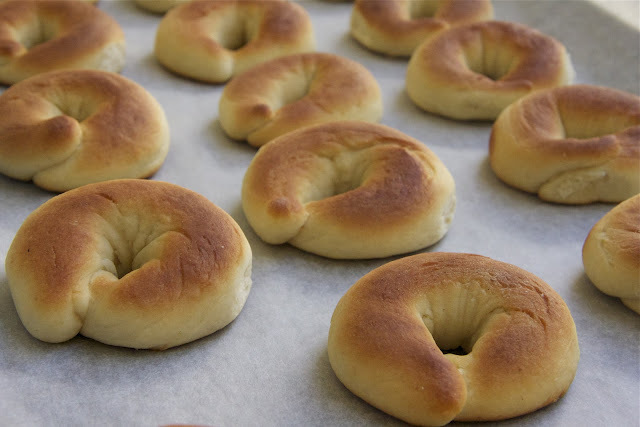 At Easter the same dough is used to make a larger round bun, called Kaak el Eid or A’ras. These are sometimes flavoured with aniseed or orange blossom and embossed in the centre with a cross shape. They are usually distributed at the end of a church service, or simply baked at home and shared with visitors. The best recipe of kaak bi haleeb that I have come across is our aunt Aida's who has lived in Brasil for the past 65 years. She has kept this tradition alive and although she guards her fantastic recipe with care she likes to share it and explain it with the most detailed instructions. This recipe is kneaded by hand you can however make it is a mixer without having to ‘activate’ the yeast. Simply rub the yeast into the flour using your fingers, just as if you were making a crumble and mix as instructed. Warm the milk in saucepan and leave the butter to melt in it. Stir the sugar in and dilute it. Be careful not to over heat, keep the mixture tepid. Mix one tablespoon of warm milk together with one teaspoon of sugar together with the fresh yeast. Stir until combined. Allow about 10 minutes for the yeast to ‘activate’; it will froth on the surface. Place the flour in bowl and form a mound. Add the milk and butter mixture and the diluted yeast. Transfer the dough onto a work surface and fold and stretch it with your hands to get lots of air in. As it starts to come together it will come clearly off the work surface. This should take you about 10 minutes. Alternatively you can knead it in a machine for about the same amount of time. Form the dough into a ball and place it in a bowl which you cover with a tea towel. Leave to rest for an hour or two in draft-free place. The dough is ready when it has doubled in size. Divide the dough into 20 pieces of equal size. Roll each of the pieces into a sausage-like shape and bring both ends together and pinch to achieve a ring. Place each of these galettes, on an oven tray lined with baking paper. Leave the rings to prove for about 30 minutes. They should again puff and double in size. Pre-heat the oven to 180°C and place the baking tray in the middle shelf. Depending on your oven kaak should bake in about 15 minutes. The tops are then a golden brown colour and the dough firm and spring-like to the touch. Turn out onto a wire rack. Leave to cool. A'ras is still made at Easter by my Syrian American friends in Jacksonville, Florida. Many of the first Syrians to Jacksonville came from Zahle. Great detective work on this quest! If I used dry yeast sachets instead of fresh would the amount be the same? Cant wait to make these!! !